The pizzas will be given away 5, 000 at a time across four days on Domino’s Facebook page. The first 5, 000 have already been handed over to customers but for the next month, Domino’s will also offer daily deals to their customers including free toppings and upgrades. Domino’s Australia and New Zealand, Chief Executive Officer, Nick Knight, said those after the free pizzas but that Domino’s is ready for the increase site traffic the giveaway will bring. “It will be first in, best dressed – or best fed in this case,” Knight said. Domino’s has launched its new Quality Fresh menu and the giveaway campaign with a number of pizza-friendly events scheduled for the next month, including football grand finals, long-weekends and school holidays. The Quality Fresh menu includes “premium pizzas” such as butter chicken, chicken meatballs with BBQ sauce and a salted caramel thick shake. 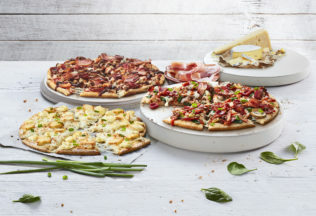 “We are really proud of every one of our new premium pizzas, which is why we’re giving customers the opportunity to try any of our new premium range; they are larger and have noticeably more toppings, making them fantastic value for a premium product,” Knight said.